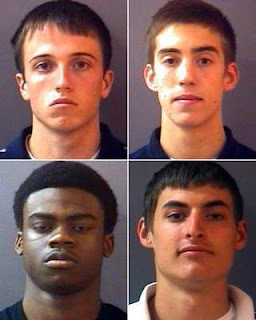 Carmel basketball players Brandon Hoge, (clockwise, from top left) Robert Kitzinger, Scott Laskowski and Oscar Falodun were booked at the Hamilton County Jail and freed on bond this morning. - Submitted by Hamilton Co. Sheriff's Dept. After months of secret wrangling, 4 young men were arrested for hazing another students at Carmel High School in Indiana. The details are murky, but at the very least there were 2 separate incidents; one in the basketball locker room and other on a bus trip from an away game in which the young men pictured above were accused of hazing their classmates. There are so many things that anger me about this case I almost don't know where to begin. But, before I do, in the interest of full disclosure, I have to admit, I was never bullied in school. I vividly recall being picked on somewhere in the 2nd grade for my high pitched voice. 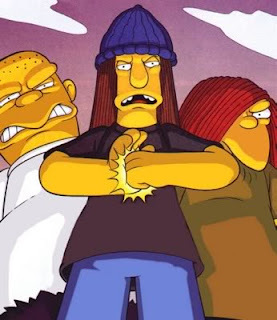 I believe the taunt had something to do with Welchkins. I proceeded to dump my tormentor in a barrel trashcan and that was the end of it. I didn't bully other kids. I never understood it. Don't mistake me, I was not by any stretch of the imagination a perfect kid, but I am confident in the fact that I didn't go out of my way to make another kid's life hell. I cringe listening to grown adults telling their stories of being relentlessly picked on for sport. High school was a great time for me. But, for so many others, it is their living nightmare. A nightmare that they carry with them. A particularly disturbing thought to me is the fact that this occurred on the bus, with all the coaches on board. It is bad enough that the accused attacked one of their teammates, but the fact that the coaches let it go on is unconscionable. I don't for a second believe that they didn't know what was going on. I've been on the team bus and the coach heard a whisper from the back row. Kids should feel safe in school. They shouldn't fear it. And when they are afraid, they should have someone to go to. Every after school special tells you to go to a teacher or a coach. But when they condone the behavior, what is a kid to do?